Singer and songwriter Gene Burnett appreciates local music in one of its rawest forms ­­— an open mic session without amplification. "I like open mics," he said. "I like listening to what people in my community are doing. You don't have to be a star to play at an open mic." Burnett, 52, will be the host of Tease Unplugged, a non-amplified open mic session held on the second Monday of every month beginning at 8:30 p.m. Monday, Oct. 12, at Tease, 303 E. Main St., Ashland. Musicians can bring their instrument and just play, Burnett said. "It's a quieter listening vibe rather than a noisy bar scene," he said. 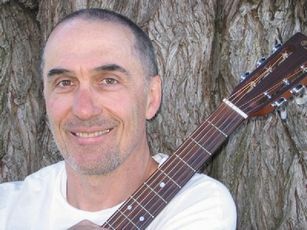 Burnett also is an avid open mic performer and frequently plays at open mics at Wild Goose Cafe & Bar in Ashland. He also has gigs at Evo's Coffee Lounge, Tease and Liquid Assets Wine Bar in Ashland. "I play anywhere I can be heard," he said. "My experiment is to put my music out there as freely and easily as I can and see what comes back." Also a t'ai chi instructor and self-published author, Burnett plays acoustic guitar and writes songs as a hobby. "I often call my music the folk side of pop music and the pop side of folk music," he said. He has written two books, "Songwriting for Geniuses: 25 Tips for the Genius in Everyone" and "T'ai-Chi for Geniuses: a Practice Companion for the Genius in Everyone." In his book "Songwriting for Geniuses," Burnett tries to inspire songwriters to write songs that are satisfying to themselves. "A lot of people want to write a song that will get them attention and get them money," he said. "It's really about paying attention to your own inner wisdom when you're writing opposed to paying attention to the charts." Burnett said a good song is one that releases a charge for the writer. One that makes you smile or tap your foot to the beat. On his Web site, www.GeneBurnett.com, Burnett is experimenting with donation-based downloading. He has songs from 19 albums available in MP3 format for free. His 20th album, "Flow More Force Less" will also be available by the end of October. His albums are simple recordings of songs he sings and plays on his guitar, not produced sound. He said many of his songs are directed to people in his life, impersonate another character, address current issues or are life stories. "We can't control other people's response to our music so I encourage people to please themselves first," Burnett said. "Let them like it or not, that's their business." Burnett's next gig will be from 10 a.m. to 1 p.m. Saturday, Oct.10, at Evo's Coffee Lounge, 376 E. Main St., Ashland; followed by a gig from 2 to 5 p.m. at Lithia Artisans Market in Ashland. His books are available at www.geneburnett.com, www.amazon.com or www.iUniverse.com. Reader Reaction We welcome your feedback on this story, or any follow-up story ideas you might have. Please send a letter to the editor to letters@mailtribune.com, or submit story ideas online here. When submitting a letter to the editor, please review our submissions policy. Copyright 2009 Southern Oregon Media Group, a subsidiary of Dow Jones Local Media Group. All Rights Reserved.